The love of patterns and paper and pretty things and personal expression. They're about the joy of receiving special thoughts in the mail. About giving you a place to scribe your passions and loves and desires and brilliant ideas. They're about designing products that make a statement about who you are and what makes you tick. About creating scents to melt your tensions and raise your spirit. The Pink Door Paper Company is a Vancouver based studio that was created by Sean & Renuka Carter as an outlet to merge his passion for design with her love of personal expression. Every product is designed, produced, printed, and hand packaged locally. They make every effort to source all of the product's materials locally or regionally. They do not print or import any part of product or packaging from overseas. For more info, check out an artice in this month's Canadian House and Home Magazine. love those cards! they ll be great for a girl baby shower! cuuuttteeee!!!! 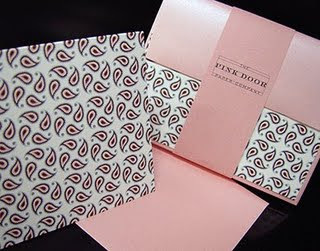 So glad that you enjoyed our profile on the Pink Door Paper Company in the December 2009 issue! Please feel free to hyperlink to us at http://www.houseandhome.com/magazine/latest for lots of other great product suggestions! Lis.